Google released WebVR back in 2016 as an experimental project with an aim to make virtual reality available to masses by bringing it to the web platform and supporting all the virtual reality headsets ranging from entry models like Goole Cardboard to high-end headsets like Oculus Rift and HTC Vive. In the initial phase, both Google Chrome and Mozilla Firefox supported Google’s WebVR. The project was in constant development over the last two years, with Google showing off the progress every time it could. However, in the September of 2017, the Google Chrome team revealed that WebVR was being reworked from the ground up to increase the support for even more devices. While this was being worked on, a few weeks back we saw the launch of Google’s new augmented reality on the web project, which the company featured in a blog post on its website. The project allowed users to interact with 3D objects (referred to as articles by Google) on the web and even aims to allow users to use their smartphone cameras to put the objects around them, just as they can do it using Apple’s ARKit or Google’s ARCore. VR is great at giving you a sense of scale relative to yourself, while today’s mobile AR is great at giving you a sense of scale relative to your environment. So imagine you’re looking for a piece of furniture or a TV or something similar for your home. An app built for both VR or AR could let you stand next to the object in VR, at the correct scale, to get a sense for how big it is. The AR side of it could then project that same object into your room to indicate it if will fit the space. Of course, the really exciting point will be when you can do both with a single headset, getting that personal sense of scale and grounding in your environment simultaneously. It’s clear that Google is now focusing more on the augmented reality side of things rather than VR. In hindsight, augmented reality is better than virtual reality as it doesn’t require users to use costly virtual reality headsets. Currently, augmented reality capabilities might be present only on high-end smartphones, however, when its released for the web, it can be made easily available even on the low-end devices. 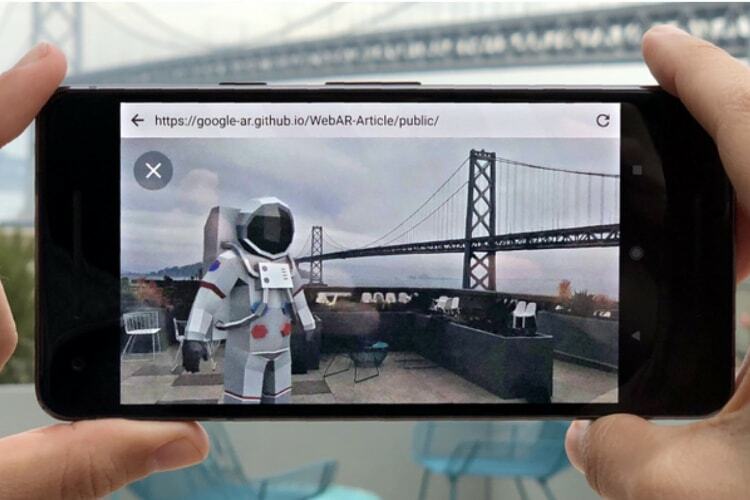 For now, WebXR is not yet integrated into Chrome, but Google has built an experimental browser with WebXR support for developers to try out.